It’s already our third month with Zamplebox, and we’d expect the service to have a good handle on our flavor preferences by now. We’ve taken full advantage of the new flavor profile and juice rating system, and followed their recommendations on the number of flavor types (15) that we should have liked and disliked in our member portal. The result? A box that we have no complaints with, and actually needed to look for reasons to gripe. The Best Zample Box Yet? October’s box does seem to have a theme to it, and that was around creamy/dessert vapes. Except for one, all included some type of creamy base, which was okay by me. I finally got to try a good custard vape, and Zamplebox again tested my limits with a lemon-based flavor which didn’t disappoint. But this is a review so I can’t be 100% happy. Here’s the one nitpicky part of my third Zamplebox review: I would have appreciated more variety in style. Cream-based vapes are great, and some of my favorites, but this box was loaded with them. I would have rather had these split across two boxes, with some other juice types mixed in: vaping the same type of e-juice every day can get old. I won’t complain too loudly, though, since I have some juice left over from last month that I can mix in with these flavors. But I’m hoping this new system doesn’t start working too well and end up pigeonholing me: I signed up to Zamplebox to discover new, unique juices that I didn’t know I’d like. I’m not arrogant to think that my first Zamplebox review had anything to do with it, but the Zamplebox e-mails haven’t been much of an issue this month. You might remember my complaints about receiving so much promotional e-mail from them that it borderlined on spam. That has significantly lessened; I’m averaging about a message per week now. I’m not sure if this has something to do with being a longer-term member, but if it is I’d certainly recommend the company reconsiders its e-mail frequency to new members. Give them time to breathe. Just wanted to provide an update on that one (minor) complaint. Otherwise, let’s move on to this month’s e-juice reviews! As I said at the beginning, there are a lot of cream-based flavors in my third Zamplebox review. Opening the box was a big surprise, though: Kilo is apparently a Zamplebox supplier! The company makes some of my favorite e-juice, and I can’t get these locally for any less than $19 for a 15ml bottle. Got two here, one of which is my favorite flavor. So at $24.95 for the whole box, just in those juices alone I’m in the black. So what did I think of this month’s “menu”? Arney P. by RVAapors (4/5): Described as a green tea lemonade, I’d honestly describe it as more of a lemonade with just a splash of green tea. I’m not a fan of lemon flavors traditionally, but this is a great, refreshing vape. Only complaint I’d have as a dripper, is that the bottles are a little thin and their juice a tad runny (surprising considering its 80% VG): this means you might end up with a little more juice in your coil than you planned. Dewberry Cream by Kilo (5/5): Kind of unfair to include this one in here since it’s one of my all-time favorites and I’ll automatically give it a perfect score, but Kilo is on point with this one. Honeydew and berry do very well together in e-juice, and with just a pinch of cream it’s absolutely delicious. If you’re a fruit vape guy, this is a sure win and I’d highly recommend picking up a bottle even if you’re not a Zamplebox member. Fredo by Genco (4.5/5): I was scared of this one. I’ve tried yogurt flavors before, and the flavoring is absolutely overpowering. Kilo has yogurt flavors, but theirs are so thick it’s kind of nauseating. Genco did well here. It honestly tastes like Yoplait. Makes me feel like I’m eating healthy (which I don’t). Not an all day vape for me, but a good switch-up every once in awhile. Lake Custard by Eve E (5/5): I finally tried a custard vape! Eve E describes it as a “smooth and creamy vanilla custard,” and I think they nailed it. Classy flask-like bottling too. A dessert vape for sure, but I’m finding myself turning to Lake Custard as a more of a relaxing end-of-day treat. Creamy and sweet, I would certainly recommend it to custard vape fans. Short Circuit by High Voltage (3/5): I had high hopes for this one, but because it was in the same box as Kilo’s Dewberry Cream it kind of took a backseat. It’s supposed to be a melon and berry cream, but I wasn’t overly impressed. The flavor was pleasant, but it was definitely on the weak side and a little disappointing. Might need some time to steep. Tru Blue by Kilo (4/5): The second of the Kilo juices in this box. Another custard flavor, I’ve always chickened out from buying this at my local shop because I’m just not big on blueberry. You certainly get a better custard taste out of Lake Custard, but the blueberry flavoring is not too overpowering and compliments it well. In general, a solid choice. All in all? I’ve got to hand it to Zamplebox, they’ve done it again. Reddit had me scared about these guys, who are apparently not fans of the company nor its CEO. I will say this: I’ve taken the time to give Zamplebox as much information as possible, and they haven’t let me down. The juice quality is there, no matter what Reddit is saying. Rule of thumb? Don’t believe everything you read on the Internet. Still a happy customer, and I’m hard to please sometimes. Plus, the amount of money I’m saving on e-juice right now is considerable. 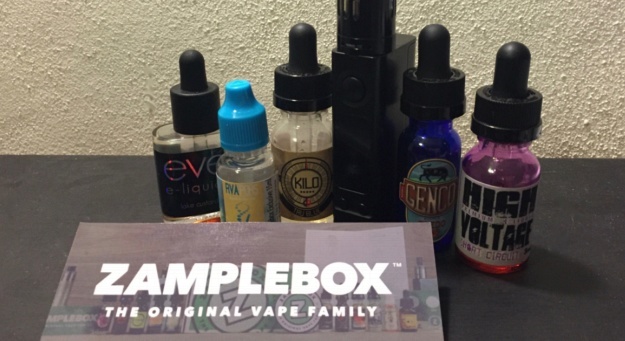 Until we complete our next Zamplebox review… ENJOY YOUR VAPE!